I know, I know, this review is SO late – I apologize. But let me introduce to you Art of Organics – so rightly named one of “6 Green Beauty Boxes You Must Subscribe To Now” by Thoughtfully Magazine. Each box contains 2-4 FULL SIZED products, purposely put together, beautifully wrapped and shipped right to your front door. 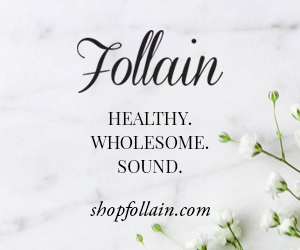 Founder, Claire Molyneaux describes each box as a “love letter” to the importance of the self-care ritual. Even the packaging is lovingly designed by a different artist every month to correlate with Claire’s theme. Each box retails for $70 +… so a monthly subscription of $39 is a literally a steal. 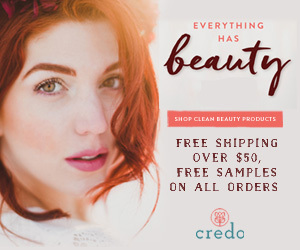 Plus, you’ll receive 15% off on any items you purchase from their shop, and there is free shipping on orders over $39. You can sign up for 3, 6 or 12 month subscriptions that save you some extra money. Now to be brutally honest, initially I wasn’t sure if I needed another subscription box. One can only have so many beauty products before it’s overwhelming. But when my first Art of Organics box arrived at my doorstep at 7:39am on a brisk Friday morning, I knew I was hooked. November’s “Grace” box is about gracefully aging into yourself and skin, featuring Skin Owl’s NECK + concentrate ($68) and the EYE+ concentrate ($46), a retail value of $114! And it does just that. You will immediately notice how smooth your skin looks – even the deepest of neck wrinkles look diminished. When I step out of the shower, I use 1 pump to cover my neck, décolleté and even my face on the days I want to look flawless. 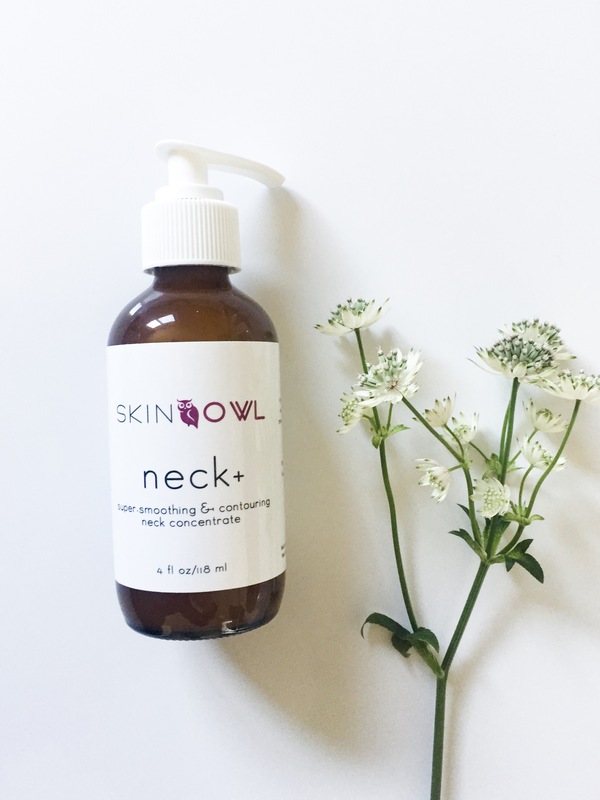 The Neck+ concentrate not only smooths and tones, but also acts as an incredible base to the rest of my skincare lineup. For those sensitive to smells, NECK+ is odorless! So start slathering this all over. So… I don’t know what came over me, but one night I binge watching Eight Below and Homeward Bound. Not only was I up way past my bedtime, I was crying uncontrollably the entire time. A.K.A the perfect equation for swollen, puffy eyes the following morning. I generally put spoons in the freezer to act as “mini ice packs” but then I was introduced to Eye+ concentrate. Cucumber and aloe help to soothe the skin, while the hyaluronic acid helps to plump and hydrate the skin. Periwinkle and licorice work to prevent aging, and naturally lighten any pigmentation. 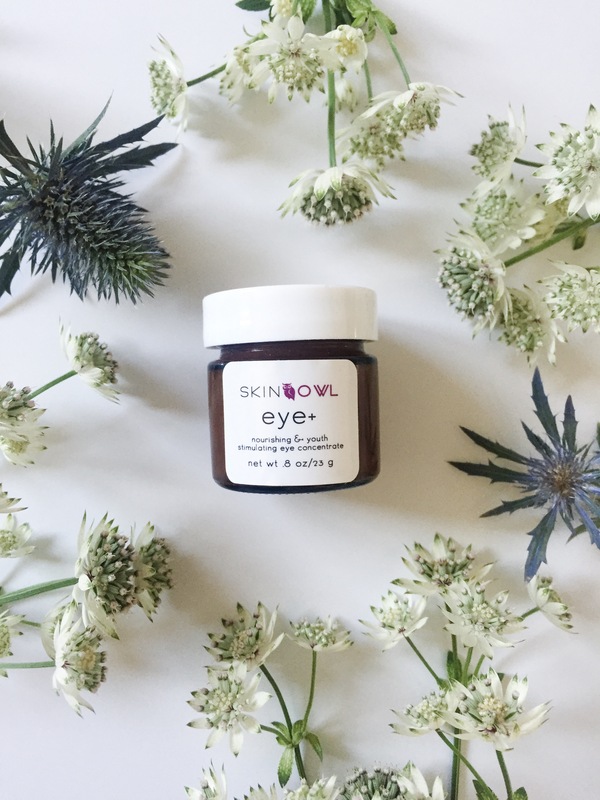 The soft, gel-like texture melts instantly into your skin and has a freshly cut cucumber scent, that makes the Eye+ great for men & women alike. Organic Herbal Infusion, Organic Aloe Barbadensis Leaf (Aloe), Cucumis Sativus (Cucumber Distillate), Organic Simmondsia Chinensis (Jojoba Oil), Cassia Angustifolia Seed Polysaccharide (botanical hyaluronic acid), Methylsulfonylmethane (MSM), Hydroxyethyl Cellulose, Carrageenan Gum, Silk Protein Amino Acid Blend (Sodium L-Pyrrolidone Carboxylate, Sodium Lactate, LArginine, L-Aspartic Acid, L-Pyrrolidonecarboxylic Acid, Glycine, L-Alanine, L-Serine, L-Valine, L-Proline, L-threonine, L-Isoleucine, L-Histidine, L-Phenylalanine), Wildcrafted Vinca Major (Periwinkle), Organic Glycyrrhiza Glabra (Licorice), Tocopheryl Acetate (Vitamin E), Sodium Benzoate, Potassium Sorbate, Ethyl Hexyl Glycerin. 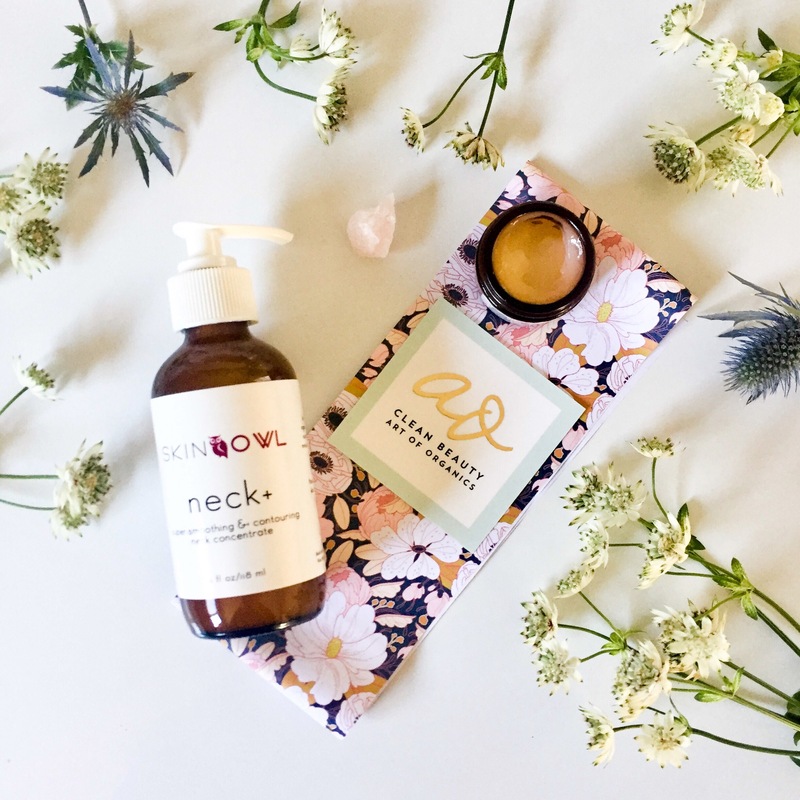 You can purchase both the NECK+ concentrate and EYE+ concentrate from the Art of Organics Clean Beauty Store. Don’t forget, if you’re a member to the monthly box you’ll receive 15% off all products in the online store! Have you tried any other Skin Owl products? What were your favorites? Oh I need to try Skin Owl soon! !